posted by Rob Stryker on Mar 03, 2015. 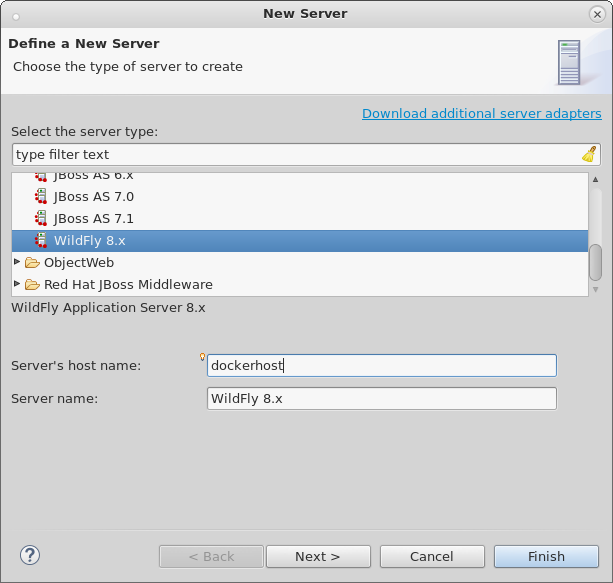 If you’ve already gotten started with trying out Docker and JBoss Tools, and want to see what other options are available, this blog post will explain how to run Wildfly in a Docker container and configure it for management tasks and managed deployments. Since the default jboss/wildfly Docker configuration doesn’t expose the management port by default, we’ll need to customize it, and this means writing your very first Dockerfile. Our goals here are to add a management user to the Dockerfile, and also to expose the management ports when running the container. You can see that we’re extending the original jboss/wildfly container. In the above RUN command, we’re also adding a management user. Feel free to customize the password as you wish. Exposing actual or sensitive passwords in a publicly accessible Dockerfile is dangerous. Make sure to only use example credentials in publicly available Dockerfiles. Finally, we’re making sure that when the Docker container runs standalone.sh, it is also making sure to bind the management port to all possible hosts, helping to expose it for use. To run your new configuration, run the following command, replacing the last parameter with what name you chose when building the Dockerfile. Note that, unlike the previous post, we do not need to launch with custom volume mappings. All we need is the addition of the management port. When creating the server remember to set the host to be dockerhost ( at least on OSX and Windows ) as shown above. Since we’ve configured the server to be remote, and for communication with the server to be handled over the management port, we mark it as Remote and controlled by Management Operations in the second page of the New Server wizard. We also don’t require a runtime here, though we may need one later when creating a functional web project with classes. For now, we won’t create one. You’ll also note that we have marked that the Server lifecycle is externally managed, which means we won’t be starting or stopping the server via JBoss Tools, since you’ll be controlling that via Docker on your own. On the next page, you’ll note that our remote runtime details are optional. Since the server is configured only for management operations, we have no real need to know where the filesystem is located or how to access it. We can safely ignore this page and just proceed through it. Now, your server is created, but we still need to set the management credentials. First, double-click your Server in the Servers View to open the Server Editor. Then, set your credentials as you did in your Dockerfile as shown below. You’ll note that some default values are already there, and so you’ll need to delete them and set your own values. In this example, we can create a very simple web project by browsing to File → New → Dynamic Web Project, Once the web project is created, we can create a simple index.html in the WebContent folder. In Eclipse, we can now right-click our server, and select Start. This shouldn’t launch any commands, since we marked the server as Externally Managed. The server adapter is configured to check over the management port at dockerhost:9990 to see if the server is up or not, so it should quickly move to a state of [Started, Synchronized]. We can now right-click on our index.html project, and select Run As → Run On Server and follow the on-screen directions to deploy our web application. We should then notice the Eclipse internal browser pop up and display the content of our index.html files. 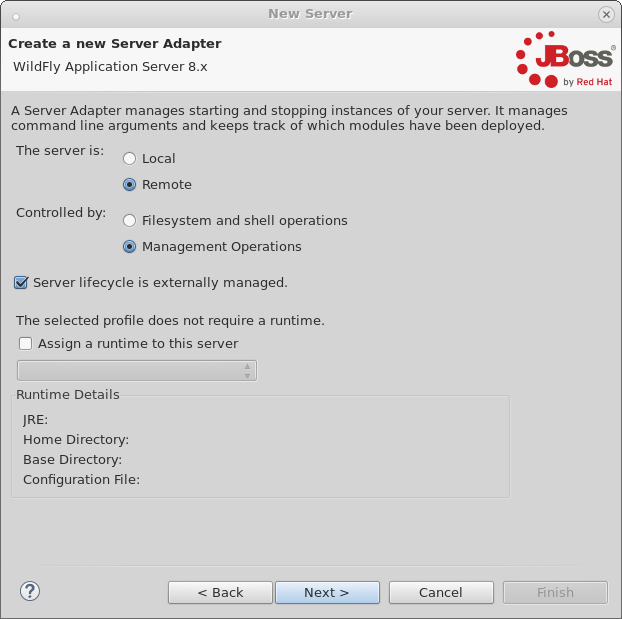 In this second example, we’ve seen how to install and configure a Wildfly Docker image customized for management operations in JBoss Tools. As you hopefully noted, this kind of setup is much more straightforward (no messing with paths); unfortunately it does have a downside since all publishes are full publishes over the management API. Because of this, incremental updates will not work in this case. In a future example, I hope that we’ll see how to create an image customized for SSH access, which will allow starting and stopping the server and support incremental updates.